Unlike the first season, we didn’t have to wait until the end of the season for the big reveal. (That should be a clue that a major spoiler is coming for those behind). 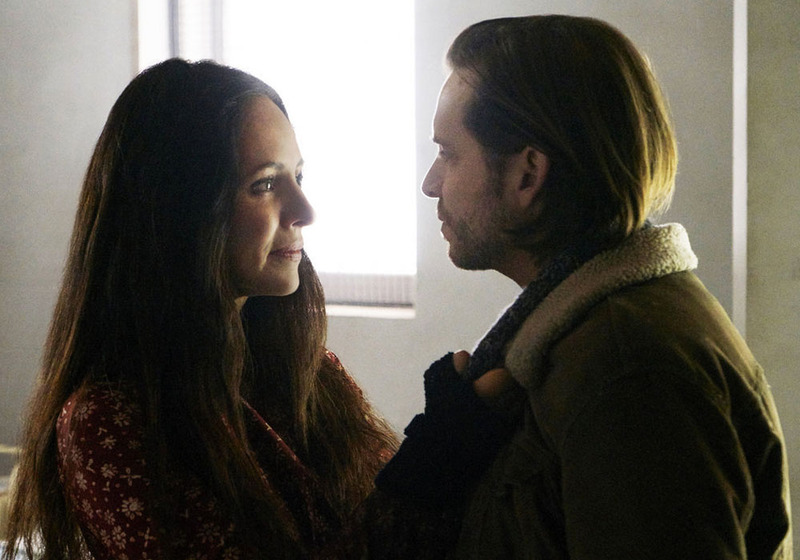 Fans have speculated since the first episode that Eliot was really in prison or a psychiatric institution rather than living with his mother to provide more structure. This week, his psychiatrist asked Eliot where he believed he was. His mother’s townhouse faded away and he admitted to us that he had been suppressing the fact that he was in prison. 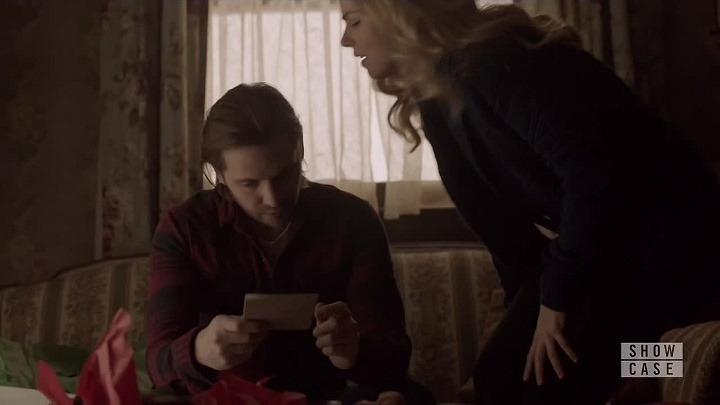 Where did the idea come from that you were going to disguise Elliot’s surroundings in this way? Sam Esmail: It came from a two-prong approach. We knew exactly what the fate of Elliot was at the end of the last season, and we started breaking this season’s storyline. We’re always trying to stay as authentic to Elliot as possible, what he’s going through. Knowing Elliot, from the very first episode, he definitely has interesting coping mechanisms. Even from the pilot, he has this ability to reprogram his life: E Corp was turned into Evil Corp. When we thought about him being in prison, what would be that coping mechanism, this came to mind. The other approach was his relationship to us — to his “friend” — and how we left him at the end of the first season. He basically didn’t trust us anymore, he felt we were keeping things from him. So we wanted to develop that relationship as well. That was the one approach of, “This is what Elliot would do in this situation, to cope with being in prison,” and then the other of keeping it from us because he felt betrayed by us from the first season. When we spoke at the end of season 1 about the Mr. Robot revelation, you said you would be hesitant in the future to do things that would leave people questioning the reality of the show. Did you have any concerns about doing another big, “This is what it really is!” reveal in that way? Sam Esmail: I did. I remember bringing it up to the room. The one thing I also told you is I wanted to stay as authentic to Elliot as possible. And the truth of the matter is, the show is about mystery, and there will always be questions and we won’t actually see the full picture all of the time. Having said that, if we can’t invest in what is happening and what is going on, that would become very frustrating, to the point where you wouldn’t feel any stakes. That was the test we ran through with this idea: is this actually happening to him? Is what he’s experiencing still real? And can the audience still buy into this after the reveal? Those answers were obviously yes: the events that we saw were still very much real, and the consequences of them are real, and what Elliot went through is real. It’s just the coping mechanism he used was not exactly what he saw. To me, it was definitely one of those things that prompted a real conversation. Like I think I told you last year, we’re not in it for gotcha moments or shocking the audience, but we’re in it for interesting reveals and deepening and enriching Elliot’s experience. We felt that him going through his prison sentence in this way was more true to life to Elliot than actually having seen it as a prison. But you understand how fandom works. Having done this two years in a row, you’ve now conditioned them to, whatever you do next, the fans will pick it apart frame-by-frame to explain what’s actually happening. 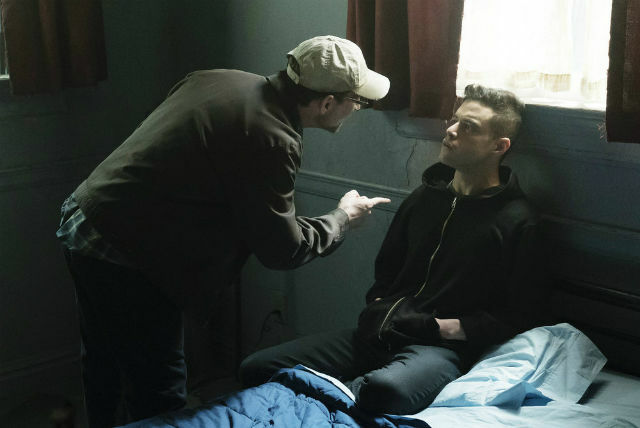 Sam Esmail: Yeah, well, truth be told, don’t you feel like it’s already happening this season? True. How did you feel about people having this exact theory of prison after only the season premiere had aired? Sam Esmail: It was weird. One thing that we always do is we never want to cheat the audience. We never want it to be some extraordinarily contrived thing where we’re basically lying to the audience and what they’re seeing isn’t actually happening, and we’re fooling them. In doing that, and being honest with what is going on, even though the surroundings aren’t actually what they are, we didn’t really hide it that well, right? I didn’t expect people to catch on from the very first episode, but I thought people would start to theorize and catch on. Look, a reveal is great when it’s surprising, but it’s terrible when it feels like a cheat. To me, the fact that some people who guessed it may not be surprised, it verifies that we didn’t cheat anybody, because it adds up and makes sense to them still. I’m sure much of this will be explained in future episodes, in terms of why Elliot was in prison to begin with, but was Ray a guard in the prison? How much of Ray’s business involved prisoners versus the outside world? Sam Esmail: That’s going to get revealed in a couple of episodes. By sending Elliot to prison, you also spend the first half of the season with him physically separate from the other characters, give or take a brief visit by Gideon or Darlene. What did you see as the advantages and disadvantages of having him apart from the rest of the ensemble, other than Mr. Robot? Sam Esmail: I’m glad you asked that question. Obviously, knowing we were doing this, it was very important for Elliot to address this incredibly internal conflict that sprung on him at the end of the first season: that he has an alter ego that he can’t control. That was the first and foremost issue that I wanted to tackle with Elliot. So of course the isolation of him being in prison really helped that. It meant that we get to basically do this deep dive into his internal battle with his demons. 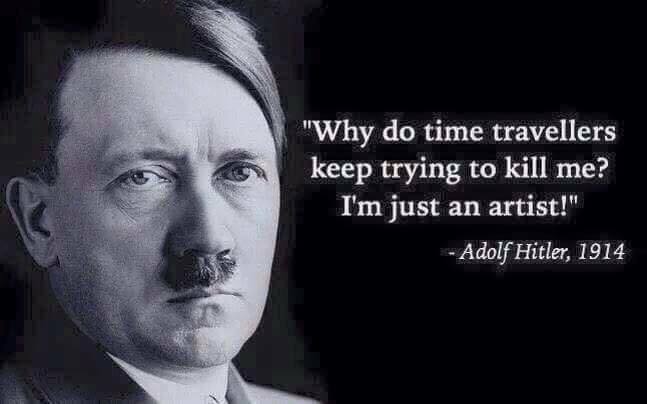 There is not much else for him to do. He couldn’t escape it. So it was great on that level. I knew it was going to be a polarizing choice to go in this direction with Elliot, but for whatever reason, it felt organic and natural. But when I took a step back and looked at the whole season, I realized that, when I think about the sequels that I really love, or second acts of movies or larger stories, they tend to do this: to go into this inward battle after accomplishing this big Herculean hero’s journey. The one uncanny similarity — which I only realized in hindsight — is Empire Strikes Back. At the end of the first movie, you take down the big band, the revolutionaries kind of win, but the second movie opens, they’re still battling, they’re still struggling, the Empire is rebuilding, and literally Luke goes off to another planet for most of that movie to learn to become a Jedi, while his sister is still out there fighting the good fight. This wasn’t something planned, but I looked at it and realized we were literally following that same pattern. And it’s not just with Empire Strikes Back. It’s Godfather Part II. There’s a lot of introspection that happens. That’s often the next stage after this huge external conflict comes to an end. Then it’s, “Well, then what?” It’s a hangover moment, of reflection and going inward. So that direction made sense for our story. Esmail was also interviewed by The Hollywood Reporter. News also came out during the past week that Mr. Robot has been renewed for a third season. In other genre news, Henry Cavill has teased what will happen to Superman when he returns for the Justice League movie, in light of what happened at the end of Batman v. Superman. Agents of SHIELD will be edgier with its move to 10 pm. It is a safe bet it will still be much tamer than the far better Marvel television adaptations on Netflix (one of which won a Hugo Award). The 2016 Hugo Awards winners have been announced. The award for Best Novel went to The Fifth Season by N.K. Jemisin. The Martian won for Best Dramatic Presentation, Long Form. Jessica Jones: A.K.A. Smile won for Best Dramatic Presentation, Short Form. Unfortunately the awards continued to be tainted by conservative politics. Mark your calendars: BBC AMERICA is coming to New York Comic Con in a big way this year. On Friday, October 7, the network will present a block of star-studded panels at The Theater at Madison Square Garden, featuring Doctor Who, with Peter Capaldi making his NYCC debut alongside new companion Pearl Mackie at her first-ever fan appearance. Ahead of its October 22, Dirk Gently’s Holistic Detective Agency will launch a world premiere screening followed by a panel with cast, showrunner, writer and executive producer. And the Doctor Who spinoff Class will have its first-ever U.S. panel with cast, executive producer, and creator of the series. 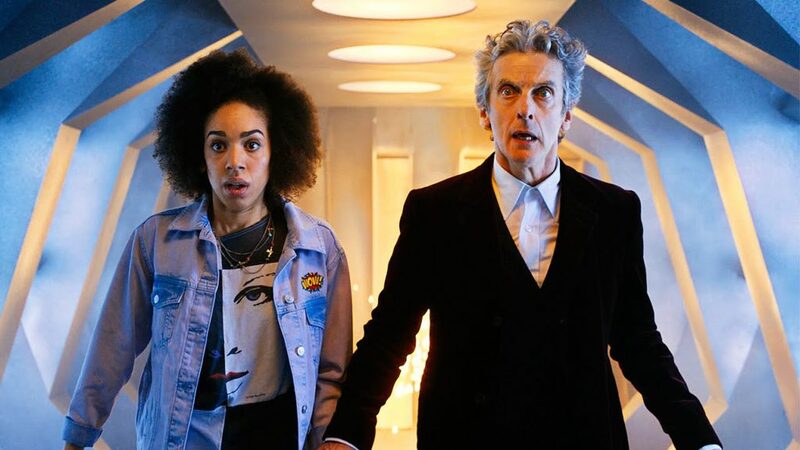 BBC AMERICA’s Doctor Who star Peter Capaldi will make his New York Comic Con debut along with the first ever fan appearance by new co-star Pearl Mackie, who joins the series as Bill, the Doctor’s new companion. When Pearl joined the cast, Emmy-winning lead writer and executive producer Steven Moffat teased “a new voyage is about to begin” and “this is where the story really starts.” Fans will get a sneak peek of what’s ahead including the upcoming Christmas Special this December on BBC AMERICA and hints on what’s in store for Steven Moffat’s final season as showrunner. The panel includes stars Peter Capaldi (The Thick of It) and Pearl Mackie (The Curious Incident of the Dog in the Night Time), as well as Steven Moffat (Sherlock) and executive producer Brian Minchin (Class, Torchwood). Doctor Who is a BBC Cymru Wales production for BBC One and a BBC AMERICA co-production. Peter Capaldi had previously suggested he would leave Doctor Who after the upcoming season, when Chris Chibnall will replace Steven Moffat as show runner. He has now told Radio Times that he has been asked to stay on but has not made up his mind. He also states that the new companion to replace Jenna Coleman has been cast and will be named soon. Supergirl has been renewed for a second season. After Captain America: The Winter Soldier delivered the game-changing twist that Hydra had infiltrated SHIELD from the inside, completely destroying the government organization that makes up the very core of Agents of SHIELD, the ABC Marvel drama became a completely new show in season one. 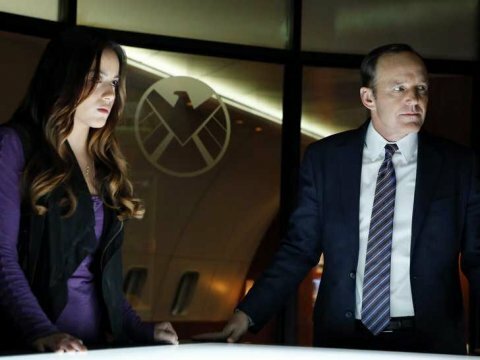 Agent Coulson (Clark Gregg) became Director Coulson of the real SHIELD, working in the shadows to take down the Hydra agents who betrayed them, including their former friend Grant Ward (Brett Dalton). The show was never the same after that revelation, and it was clear from both critical and fan response that the series was better for it. With Captain America: Civil War only weeks away from its box-office bow, Agents of SHIELD is set to change yet again as a result of whatever happens in the Marvel Cinematic Universe. After spawning low-rated but critical darling period drama Agent Carter, ABC’s first Marvel series is laying the groundwork for pilot Marvel’s Most Wanted. 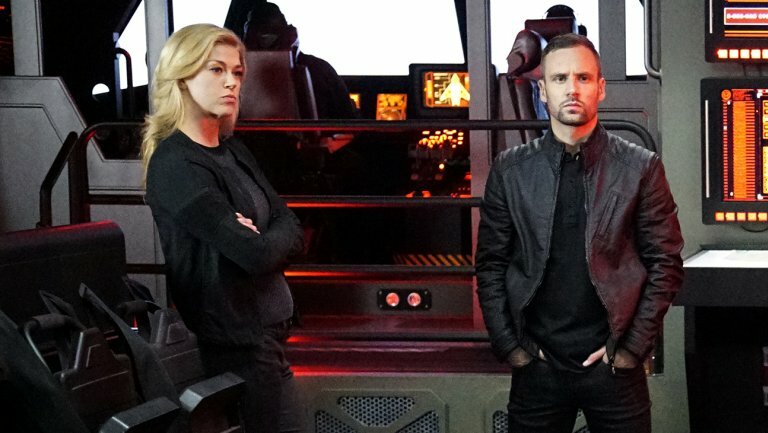 Centering on the newest additions to SHIELD, Bobbi Morse aka Mockingbird (Adrianne Palicki) and Lance Hunter (Nick Blood), the potential series would follow the two former spies and ex-spouses who are on the run with no friends, no SHIELD and a long list of enemies looking to claim a bounty on their heads. Without any allies except each other, Bobbi and Hunter will be forced to form an uneasy alliance with Dominic Fortune (Delroy Lindo), a rogue adventurer with a wealth of resources and even more adversaries, who agrees to protect them so long as they help him with his own agenda. These two heroes will help anyone in need, all while trying to uncover the conspiracy that put their own lives in jeopardy. They will continue to work with SHIELD this season and decisions as to Marvel’s Most Wanted and Agent Carter will probably be made in May. 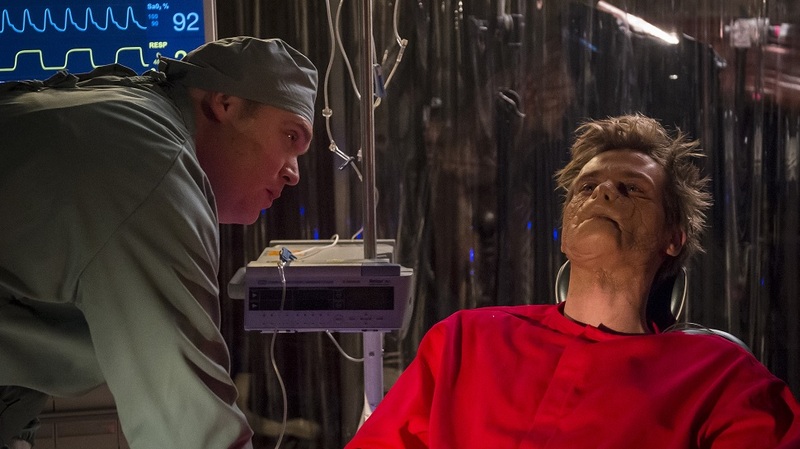 Fox has renewed Gotham for a third season. In other news on the show, Brian McManamon has been cast as Clayface. Person of Interest returns on May 5 with two episodes to air per week, airing on Monday and Tuesday. This is to be the final season. Arnold Schwarzenegger, who is about to take over as host of Celebrity Apprentice, walked out of an interview and refused to answer questions about Donald Trump’s presidential campaign when asked on Australia’s Weekend Sunrise. Schwarzenegger has endorsed John Kasich for the GOP nomination. Meanwhile Trump’s campaign continues like a bad reality show or movie, with more violence reported, involving his campaign manager. “My very first experience of ‘Star Trek’ is my oldest brother turning off all the lights in the house and flying his model of a D7 Class Klingon Battle Cruiser through the darkened halls. Before seeing a frame of the television series, the ‘Star Trek’ universe lit my imagination on fire,” said Fuller. 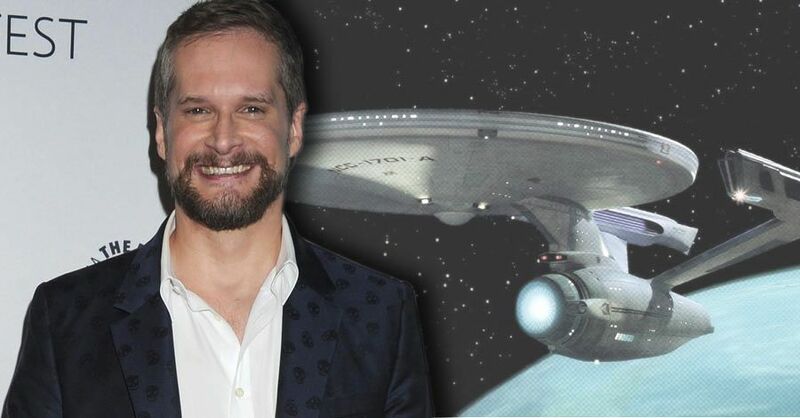 “It is without exaggeration a dream come true to be crafting a brand new iteration of ‘Star Trek’ with fellow franchise alum Alex Kurtzman and boldly going where no ‘Star Trek’ series has gone before. Fuller also has experience with Star Trek, including writing two episodes of Deep Space Nine (which he has called his favorite Star Trek series) and twenty episodes of Star Trek: Voyager. Variety reports that “The creative plan is for the series to introduce new characters and civilizations, existing outside of the mythology charted by previous series and the current movie franchises.” This still leaves open whether it will occur in the Roddenberry or Abrams time line, at what point it time it will occur, and whether it will encompass the entire Star Trek universe or be more limited as Voyager was. For Valentines Day we have a special edition of Marvel Super Heroes in the video above. Elsewhere in the Marvel universe, there is now a question as to whether Agent Carter will return as Haley Atwell has been cast in a pilot for an ABC drama entitled Conviction. It sounds doubtful that she will return to Agent Carter if the pilot is picked up, although this is a series which might return at any point in the future as time allows. Being Valentines Day, it is also significant that yet another of Rory’s old boyfriends has been cast for the Gilmore Girls revival, now adding Milo Ventimiglia. In an unexpected addition, Sutton Foster has also been cast. Will she reprise her role as Michelle and make this a Gilmore Girls/Bunheads cross over episode, will Foster play another Lorelei stand-in, or will she have an entirely different part. 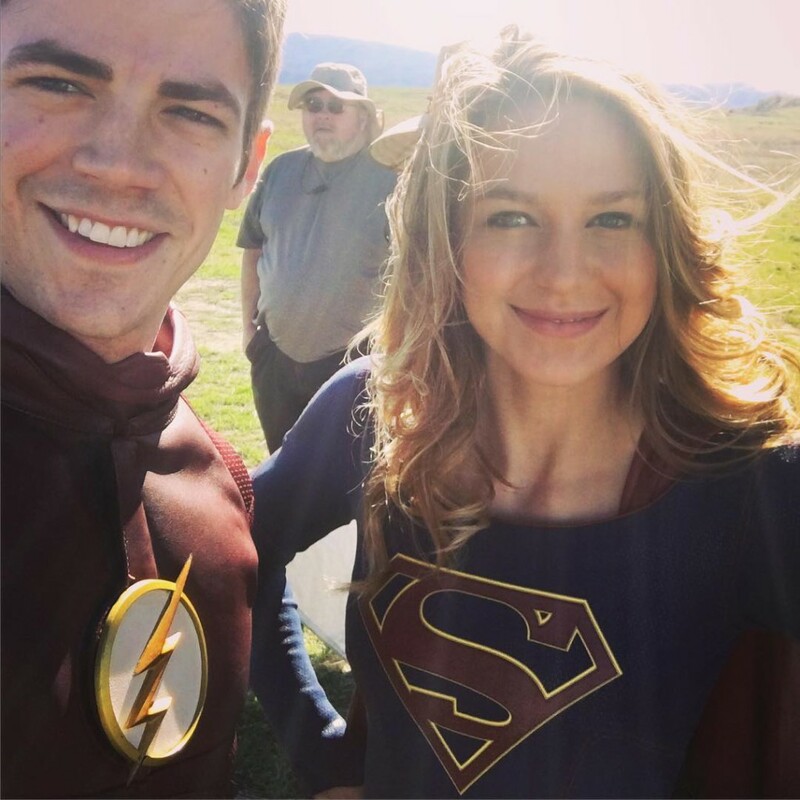 Grant Gustin has uploaded the first picture of himself and Melissa Benoist in this Glee reunion and Flash/Supergirl cross over. The latest trailer for Outlander deals with attempting to change the future due to Claire’s knowledge of history. Outlander returns on Saturday, April 9th at 9pm ET. 11.22.63 also deals with attempts to change historical events. It premiers tomorrow and it is disappointing that USA Today gives it a very poor review, advising to just watch the final episode if you are curious as to what happens. The New York Times and IGN have more mixed reviews. Adaptations of Stephen King novels do not have the greatest track record on television, as with Under The Dome. The New York Times has a much better review for Better Call Saul, which returns for its second season tomorrow. The latest trailer above for Batman v Superman: Dawn of Justice which premiers on March 25th, 2016. Syfy has renewed The Magicians for a second season. Aniz Ansari’s Master of None has been renewed by Netflix for a second season. House of Cards returns to Netflix on March 4th. Trailer above. Amazon has renewed Mozart in the Jungle for a third season. The show recently Best Musical or Comedy at the Golden Globe awards and Gael Garcia Bernal won for Best Performance in a Television Series – Musical or Comedy. 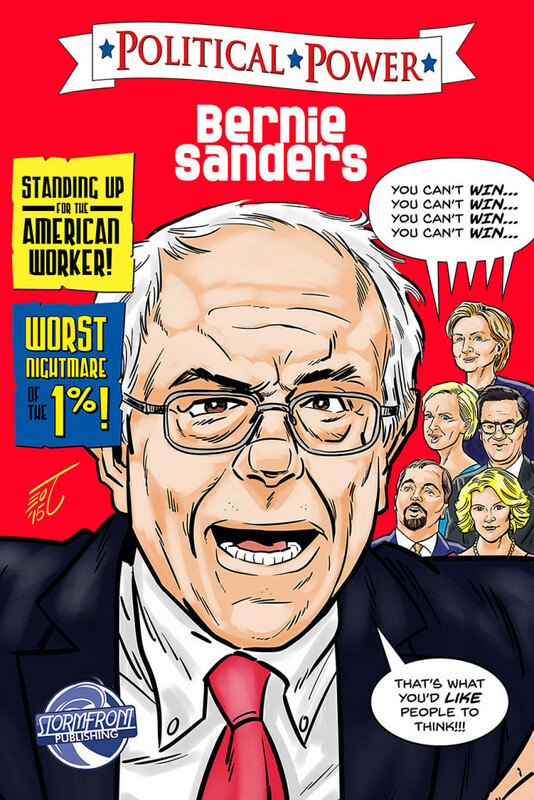 Both Bernie Sanders and Hillary Clinton are the stars of their own comics. More on the comics here. The season finale of Doctor Who, Hell Bent, concluded the three part story which began with the death of Clara Oswald in Face the Raven. It turned out that the ending of last week’s episode, Heaven Sent, contained some misdirection about where the finale was going. While the Doctor did return to Gallifrey, this was not at all what the episode was really about. The Doctor returned to Gallifrey as a war hero, and used this return to save Clara. While the leaders on Gallifrey were concerned with the identity of the Hybrid, it turned out that the Doctor did not really know the answer. His priority was in saving Clara. The Doctor was willing to break the rules of time, as he had done on occasions before, and to defy the leadership on Gallifrey. He killed a general to demonstrate how far he would go to save Clara. They escaped through the Matrix, one of several references for things established in old episodes, and escaped in an old school TARDIS. As he had started out, the Doctor escaped Gallifrey in a stolen TARDIS, this time with a functioning Chameleon Circuit. They escaped the Time Lords by going to the last hours of the universe, where they met up with Ashildr, who the Doctor had made immortal earlier this season in The Girl Who Died. While the identity of the Hybrid was never definitively revealed, Ashildr had what came closest to an answer. She theorized, “‘What if the hybrid was to people.‘A passionate and powerful Time Lord and a young woman so very similar to him – companions willing to push each other to extremes?” The Hybrid might have been the Doctor and Clara working together. Whether this is the actual answer, it was still a meaningful description of who the Doctor is. The problem now is Clara was only alive in a form with some very timey-whimey stuff which threatens the space-time continuum. Plus at any moment she could be returned to the moment of her death. The Doctor believed that Clara had to have her memory wiped to return to earth and lead a normal life, where she could not be found from her memories of being with the Doctor. (I’m not sure what would have happened the first time she had any type of medical exam and was found to be lacking a pulse). It would be a sort of repeat of how things ended with Donna Noble, although the need to wipe Donna’s memory was more straight forward on Journey’s End. Clara was watching in on the Doctor’s conversation with Ashildr and was not willing to give up the best years of her life, or her memory of them. Ultimately matters were left to chance, and it turned out that it was the Doctor, not Clara, whose memories of the other were wiped. This might make Clara safer as nobody could use the Doctor to get to her. Perhaps it also made sense for the Doctor’s memories to be erased if they were not going to remain together. As we saw on The Snowmen, it took him on hundred years to get over the loss of Amy and Rory, and after over four billion years he has not gotten over what appeared to be the death of Clara. On the other hand, this is not the first time that the Doctor has lost a companion. Is Clara that much more important to the Doctor than Rose Taylor, Donna Noble, or Amy Pond? Plus it is never clear why the Doctor and Clara could not continue to travel together. 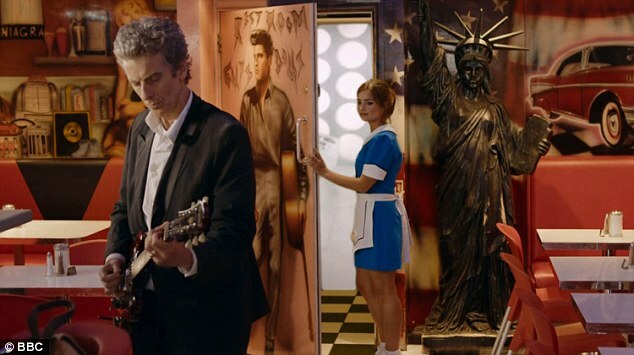 Throughout the episode, scenes were interspersed with the Doctor at an diner speaking to a waitress played by Jenna Coleman. By the end, we finally realized the meaning of these scenes, with Clara knowing who the Doctor was, but the Doctor not remembering her. The Doctor told Clara what he recalled of this story, even believing that he would remember Clara if he saw her, but he did not. He did see an image of her when he got his TARDIS back due to Rigsy’s memorial graffiti, plus The Doctor got a new sonic screwdriver. Despite the matters left unanswered on this episode, it was all worthwhile for the ending in which Clara, who had already become like a Time Lord, ended up in her own TARDIS with her own companion, Ashildr. Again, it is not clear why Clara can travel with Ashildr, but not with the Doctor. 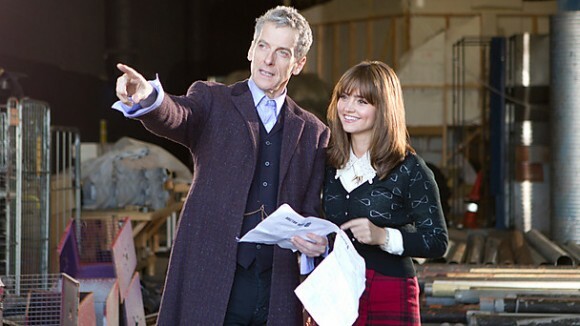 While we will probably not see Clara again on the show, I bet this will launch a lot of fan fiction. Doctor Who Extra videos for Hell Bent can be seen here. It’s Christmas Day on a remote human colony and the Doctor is hiding from Christmas carols and comedy antlers. But when a crashed spaceship calls upon the Doctor for help, he finds himself recruited into River Song’s squad and hurled into a fast and frantic chase across the galaxy. King Hydroflax (Greg Davies) is furious, and his giant robot bodyguard is out of control and coming for them all! Will Nardole (Matt Lucas) survive? And when will River Song work out who the Doctor is? The Batman v. Superman trailer was shown on Gotham last week. As I know some superhero fans are not watching Gotham due to the lack of superheroes, I’m posting it above for those who might have missed it. The Expanse officially states on December 14, but the first episode can be seen online here. Amazon will be releasing season two of Transparent on December 11, but the first episode was made available early. The second season of Mozart in the Jungle will be released by Amazon on December 30. Outlander returns for a second season this spring. Teaser above. Supergirl has been picked up CBS for a full season. 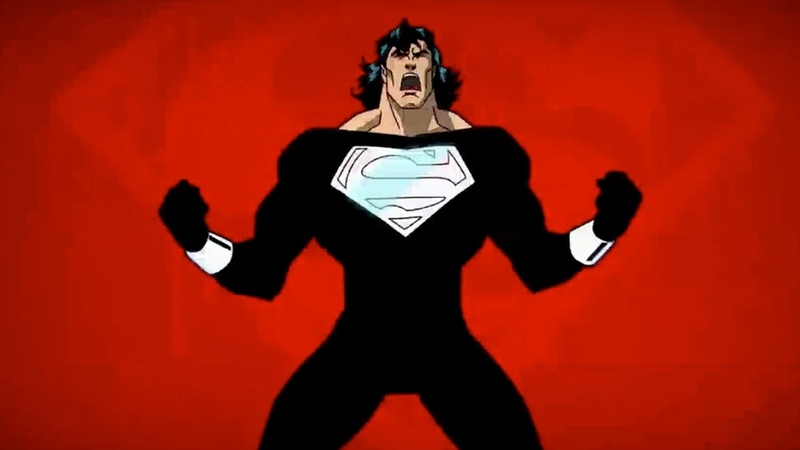 The show still seems to be trying to figure out where it is going without being too much a clone of The Flash, and sometimes struggles to be in Superman’s shadow while contractually being unable to show him as an adult (with a younger version of him to be seen this season). Now that it has a several episodes under its belt, it is starting to show more promise. Meanwhile on CBS’s sister network, The CW Network, the annual cross over episodes of The Flash and Arrow has aired. It served largely to set up Legend’s of Tomorrow, but was a fun two hours with the casts of both current shows getting together again. During the week there was also another round of rumors of a cross over episode between Supergirl and The Flash, with this once again denied (but not ruled out for the future). Fargo season three will take place a couple of years after the first season, and could include some of the same characters. FXX has renewed You’re The Worst for a second season. While an argument could be made that the show had stronger dramatic material from Aya Cash this season, I do hope that she gets over her depression and the third season returns to the dynamic between Gretchen and Jimmy of the first season. « Major Gaffes From Clinton and Trump Campaigns; Al Gore To The Rescue?